NEW YORK, Feb. 24, 2017 /PRNewswire/ -- iStar (NYSE: STAR) today reported results for the fiscal year ended December 31, 2016. Company exceeded its target of 50% year-over-year earnings growth. Net income (loss) for the fiscal year was $0.55 per diluted common share, versus $(0.62) for the prior year. Adjusted income for the fiscal year was $1.15 per diluted common share, versus $0.35 for the prior year. 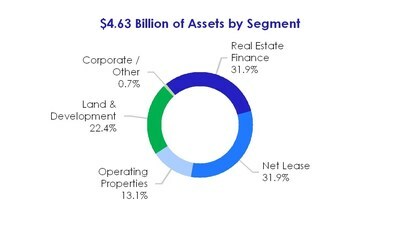 Originated $692 million of investments within the real estate finance and net lease portfolios. Monetized operating properties for $377 million, generating $109 million of income. Achieved target entitlement on approximately 90% of land portfolio. Ended the year with $749 million of liquidity. Reduced diluted shares outstanding by 38 million shares or 30% via stock buybacks and repayment of convertible bonds. Added as a constituent to the MSCI US REIT Index (RMZ). Hired Geoffrey Jervis in the newly created role of COO and CFO. iStar grew net income (loss) allocable to common shareholders for the year by over 100% to $44.0 million, or $0.55 per diluted common share, compared to $(52.7) million, or $(0.62) per diluted common share for the year ended December 31, 2015. The Company's management uses adjusted income as an internal performance measure and supplies it to investors as a supplemental non-GAAP performance measure. Management believes that adjusted income provides a useful measure of income because it excludes the effects of certain non-cash charges that management believes are not necessarily indicative of iStar's operating performance and it includes the effect of gains or losses on investments when realized. In addition, the Board of Directors determines compensation in part based upon adjusted income. Adjusted income represents net income (loss) computed in accordance with GAAP, prior to the effects of certain non-cash items. The calculation of adjusted income and reconciliation to GAAP net income is presented in the financial tables that follow the text of this press release. In the second quarter of 2016, the Company modified its presentation of adjusted income to reflect the effect of gains and losses on certain non-cash charge-offs and dispositions on book value gross of loan loss reserves and impairments. The Company also exceeded its 50% year-over-year growth target for adjusted income per share. Adjusted income allocable to common shareholders for the year ended December 31, 2016 was $1.15 per diluted common share, or $112.6 million, net of a $14.8 million loss associated with the modified definition of adjusted income. This compares to adjusted income allocable to common shareholders for the year ended December 31, 2015 of $0.35 per diluted common share, or $29.7 million, net of a $55.4 million loss associated with the modified definition of adjusted income. iStar reported net income (loss) allocable to common shareholders for the fourth quarter of $(19.3) million, or $(0.27) per diluted common share, versus $7.7 million, or $0.09 per diluted common share for the fourth quarter 2015. Adjusted income (loss) allocable to common shareholders for the fourth quarter was $2.7 million, or $0.04 per diluted common share, versus $(13.2) million, or $(0.16) per diluted common share for the fourth quarter 2015. "We made progress this year," said Jay Sugarman, iStar's chairman and chief executive officer. "We made investments in attractive real estate finance and net lease opportunities throughout the year and, during the second and third quarters, advanced on our goal of strategically monetizing certain assets within our operating portfolio. During the year, we also reached several value-creating milestones in our land portfolio. Transaction-driven earnings continue to be material to our results, which also means that earnings can be lumpy quarter to quarter. We expect this to continue in 2017 as we make further progress in transitioning our portfolio towards assets that generate recurring income streams." iStar announced net income and adjusted income per share guidance for the fiscal year 2017. The Company currently targets net income per diluted common share of approximately $0.65 and adjusted income per diluted common share of approximately $1.50 per share in 2017. This guidance assumes that general macro economic conditions continue to remain favorable. Please see the financial tables that follow the text of this press release for a reconciliation from GAAP net income guidance to adjusted income guidance. During the fourth quarter of 2016, the Company originated $202.5 million of new investments bringing total originations for the year to $691.8 million. During the quarter, iStar funded a total of $283.8 million associated with new investments, prior financing commitments and ongoing development across its four segments, bringing the total fundings for the year to $767.3 million. In addition, the portfolio generated $426.5 million of repayments and sales during the quarter, bringing total proceeds received to $1.28 billion for the year. Note: Originations represent total commitments on new investments made during the quarter. Fundings represent capital expenditures and fundings on new investments and existing assets during the quarter. Net lease originations represent the total value of originations by iStar and by its net lease joint venture in which the Company owns a 52% interest. (1) IRRs are based on contractual investment terms such as coupon, rent and term. The Company makes assumptions as to the pace of fundings, timing of construction and residual value of real estate at the end of the lease term. The net lease joint venture can elect to take on leverage and the Company makes assumptions as to the amount of debt and the cost of debt the venture will take on. The net lease IRR includes the Company's estimate of the value of the residual at the end of the lease term. While the Company believes its assumptions are reasonable, they are dependent on future real estate market conditions, capital market conditions, interest rates and decisions by iStar and its joint venture partner. No assurance can be made that the Company's assumptions will reflect actual results. At December 31, 2016, the Company's portfolio totaled $4.63 billion, which is gross of $421.4 million of accumulated depreciation and $23.3 million of general loan loss reserves. Note: The table above include the Company's pro rata share of equity method investments. (1) Includes fundings, capital expenditures, accruals, and deferred capitalized interest on loans. (2) Includes repayment of deferred interest on loans. (3) Real Estate Finance activity primarily represents repayment of a loan participation that was consolidated on iStar's balance sheet. At December 31, 2016, the Company's real estate finance portfolio totaled $1.47 billion. The portfolio is categorized into iStar 3.0 loans, made post January 1, 2008, and legacy loans, which were all made on or prior to December 31, 2007. Note: Gross book value represents the carrying value of iStar's loans, gross of general reserves. Risk rating scale based on 1 as lowest risk and 5 as highest risk. Risk ratings are based on internal metrics developed by management. They reflect management's current assessment and are not intended to predict outcomes. Actual performance of the assets may differ materially from management's current assessment of risk. See the "Loan Receivable Credit Statistics" table for additional detail on the Company's NPL and specific reserves. At December 31, 2016, the Company's non-performing loans (NPLs) were exclusively derived from its legacy loan portfolio and had a carrying value of $191.7 million, down from $222.5 million in the third quarter. The decline was primarily related to taking title to a parcel of land in downtown Chicago, IL. Our remaining NPLs include a $144.7 million loan secured in part by pledges of equity in a portfolio of hotels and is recourse to the borrower. The borrower ceased paying current interest after it filed for bankruptcy protection during the third quarter. iStar's net lease business seeks to create stable cash flows through long-term leases to single tenants on its properties. The Company targets mission-critical facilities leased on a long-term basis to tenants, offering structured solutions that combine iStar's capabilities in underwriting, lease structuring, asset management and build-to-suit construction. Since 2014, the Company has invested in new net lease investments primarily through its net lease joint venture with a sovereign wealth fund. At the end of the year, iStar's net lease portfolio totaled $1.48 billion, gross of $368.7 million of accumulated depreciation. During the quarter, the Company closed a new sale-leaseback in which it acquired two office/industrial campuses in Texas and Oklahoma for $32.7 million, or a 7.75% going in cap rate, and leased them back to an investment grade tenant for a 15-year term. The Company obtained an amortizing $19.6 million, 15-year non-recourse senior loan financing on the asset at a fixed interest rate of 3.875%. The Company intends to contribute this investment to its net lease joint venture. The Company's interest and commitment to deals within the joint venture fund is 52% of equity. In addition, the Company recorded a gain of $5.2 million during the quarter associated with the sale of one asset. (1) Same store net operating income includes net lease assets owned on or prior to January 1, 2015 and were in service through December 31, 2016. At the end of the year, iStar's operating property portfolio totaled $608.4 million, gross of $46.2 million of accumulated depreciation, and was comprised of $525.9 million of commercial and $82.5 million of residential real estate properties. During the quarter, the Company invested $15.2 million within its operating properties portfolio and received $34.0 million of proceeds from sales. These sales generated $5.1 million of gains. The Company's commercial operating properties represent a diverse pool of assets across a broad range of geographies and collateral types including office, retail and hotel properties. These properties generated $21.0 million of revenue offset by $17.5 million of expenses during the quarter. At the end of the year, the Company had $337.2 million of stabilized assets and $188.7 million of transitional assets. iStar generally seeks to reposition transitional assets with the objective of maximizing their values through the infusion of capital and intensive asset management efforts. The Company made significant progress on this goal, having either stabilized or sold approximately $450 million of operating properties including land developments repositioned into operating properties in 2016. At the end of the year, the $82.5 million residential operating portfolio was comprised of 48 condominium units generally located within luxury projects in major U.S. cities. At the end of the year, the Company's land & development portfolio totaled $1.04 billion, with eight projects in production, nine in development and 14 in the pre-development phase. These projects are collectively entitled for approximately 15,000 lots and units. The Company's asset management efforts and capital investment have transformed its land portfolio from land that was only 20% properly positioned when it took ownership to a portfolio with approximately 90% of land properly positioned at the end of the year. During the quarter, the Company transferred Grand Vista, which represented 8.8% of its land & development portfolio, into its stabilized operating property portfolio after successfully signing a lease with a Fortune 100 company covering the full use of the site. The lease has a 5-year term, with one three-year extension. Based on the terms of the lease, the initial net operating income of the property will be $7.5 million per year, versus $(0.3) million of annual net operating loss at the property prior to the lease signing. In addition, iStar sold Artesia, a 30-acre land and development project in Scottsdale, AZ for $36.0 million to a newly formed 50/50 venture between iStar and Meritage Homes. iStar recognized $8.8 million of income from sales of real estate reflecting the share of the interest sold to a third party. Both venture partners contributed $7.0 million to the venture and iStar provided the venture with a $27.0 million senior loan. The venture will seek to develop new communities at the mixed-use project, including more than 500 luxury condominiums and townhouses, a private 10-acre recreational park with running and walking trails, resort-style pools and a 20,000-square-foot community clubhouse. The two-, three- and four-bedroom residences are expected to be priced from the low $400,000s to more than $1 million. As previously discussed, iStar acquired, via deed-in-lieu, title to an infill land asset in downtown Chicago, IL which had previously served as collateral for a loan held by the Company. The Company is capitalized with unsecured and secured debt, preferred equity and common equity. During the quarter, the Company retired $378.3 million of convertible unsecured notes at maturity with $369 million of cash and 815,000 shares of common stock. Along with the $21.8 million of convertible unsecured notes that were repurchased in the third quarter, the Company reduced its diluted share count by 27.7 million shares during the year. In addition, the Company repurchased 10.2 million shares of its common stock during the year for $98.4 million, or an average price of $9.67 per share. Combined with the convertible notes that were repaid, the Company reduced its fully diluted shares outstanding in 2016 by 37.9 million or 30.1%. As of December 31, 2016, the Company had remaining authorization to repurchase up to $50.0 million of common stock available to repurchase under its stock repurchase program. During the quarter, the Company arranged a new $170 million delayed draw secured term loan with Bank of America Merrill Lynch and J.P. Morgan. The facility bears interest at an initial rate of LIBOR + 1.50%. At the end of the year, the Company had not yet drawn on the facility. Subsequent to year end, the Company repriced its $500 million senior secured credit facility. The credit facility was repriced at par and bears interest at an annual rate of LIBOR + 3.75% with a 1.00% LIBOR floor, a 75 basis point reduction from the prior rate of LIBOR + 4.50% with a 1.00% LIBOR floor. Call protection was extended for six months. All other terms of the facility, including its June 2020 maturity and 1.25x required collateral coverage, remained the same. The Company's weighted average cost of debt for the fourth quarter was 5.7%. The Company's leverage was 2.0x at the end of the quarter, within the Company's targeted range of 2.0x – 2.5x. At the end of the year, iStar had unrestricted cash and combined capacity on its credit facilities of $748.7 million. On November 30th, iStar was added as a constituent to the MSCI US REIT Index (RMZ), reflecting its hybrid business model and highly diversified portfolio. The inclusion in the high-profile index will make iStar's investment platform more visible and allow it to reach a broader pool of potential investors. iStar will hold a quarterly earnings conference call at 10:00 a.m. ET today, February 24, 2017. This conference call will be broadcast live over the internet and can be accessed by all interested parties through iStar's website, www.istar.com. To listen to the live call, please go to the website's "Investor" section at least 15 minutes prior to the start of the call to register, download and install any necessary audio software. For those who are not available to listen to the live broadcast, a replay will be available shortly after the call on iStar's website. (1) For the three months ended December 31, 2016 and 2015, includes $3,245 and $1,947 of stock-based compensation expense, respectively. For the twelve months ended December 31, 2016 and 2015, includes $10,889 and $12,013 of stock-based compensation expense, respectively. (1) Adjusted Income allocable to common shareholders should be examined in conjunction with net income (loss) as shown in the Consolidated Statements of Operations. This non-GAAP financial measure should not be considered as an alternative to net income (determined in accordance with GAAP) or to cash flows from operating activities (determined in accordance with GAAP) as a measure of the Company's liquidity, nor is it indicative of funds available to fund the Company's cash needs or available for distribution to shareholders. It should be noted that the Company's manner of calculating this non-GAAP financial measure may differ from the calculations of similarly-titled measures by other companies. Management considers this non-GAAP financial measure as supplemental information to net income in analyzing the performance of our underlying business. Depreciation and amortization includes our proportionate share of depreciation and amortization expense relating to equity method investments and excludes the portion of depreciation and amortization expense allocable to non-controlling interests. Impairment of assets includes impairments on cost and equity method investments recorded in other income and earnings from equity method investments, respectively. Effective in the second quarter 2016, the Company modified its presentation of Adjusted Income to include losses on charge-offs and dispositions of previously impaired or reserved assets to provide a more informative metric for investors to help evaluate our operating performance. Losses on charge-offs and dispositions represents the impact of charge-offs and dispositions realized during the period. These charge-offs and dispositions were taken on assets that were previously impaired for GAAP and reflected in net income but not in Adjusted Income. (1) Excludes $3,245 of stock-based compensation expense. (1) Excludes $10,889 of stock-based compensation expense. (2) Excludes $158.7 million of commitments on loan participations sold that are not the obligation of the Company but are consolidated on the Company's balance sheet.